In 1988, I took a flight in a Cessna single-engine airplane over the South Fork of the Skokomish River. The trip was offered by Project Lighthawk, an organization that used small aircraft to provide a bird’s eye view of environmental problems throughout the West. We flew over Hood Canal before reaching Olympic National Forest, where the scene was dominated by extensive brown patches — clearcuts, where all the trees had been removed from mountaintops, valleys and even steep, impassible slopes. Gone were old-growth trees, with trunks up to 6 or 8 feet across. 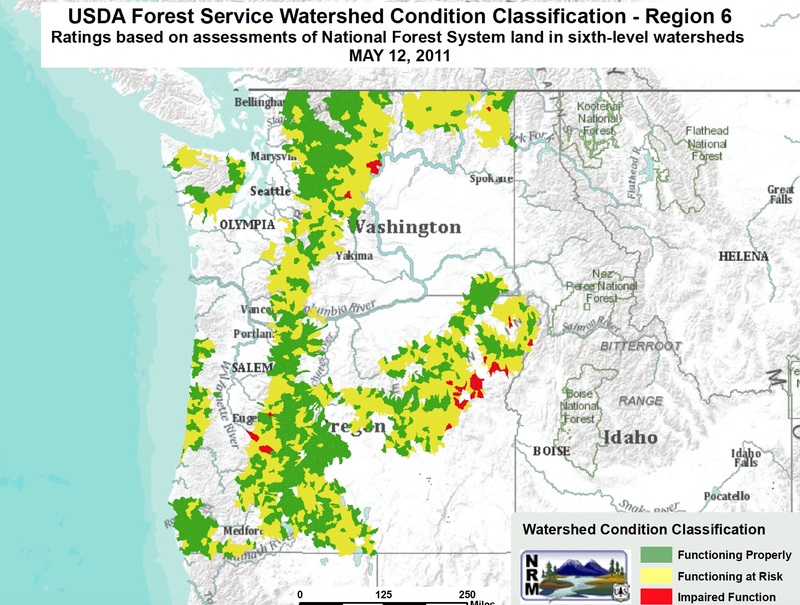 At the time, The Wilderness Society was working with Lighthawk to estimate how much land had been logged over and how much remained. Their conclusion was that the Forest Service had overestimated the amount of standing timber remaining in the area. Check out the Time magazine article by John Skow from Aug. 29, 1988. The Skokomish River is the largest river in Hood Canal and vitally important to the canal’s health. It’s also the most flooded river in the state and home to the Skokomish Tribe. At the moment, there’s a lot of activity taking place with regard to ecosystem restoration. The Skokomish River is the focus of a reporting project that has been consuming my time lately. Planned as a four-part series, the stories will examine natural values plus the history and future of the Skokomish watershed. The project is scheduled to begin on Sunday and run through Wednesday. I’d like to apologize for the lack of postings on “Water Ways” last week. As deadlines approached on this project, I seemed to put everything else aside. Now, you’re likely to see a flurry of posts as I catch up on things I’ve been wanting to talk about. As for the Skokomish, a public meeting is scheduled for Wednesday in the Skokomish Valley. For details, check my story in Saturday’s Kitsap Sun, which mentions several issues up for discussion: the General Investigation of the river’s functions, a new plan to anchor trees into the banks of the South Fork of the Skokomish, ongoing decommissioning of roads in Olympic National Forest, a study of the functions of Vance Creek and dike removals on the Skokomish delta. 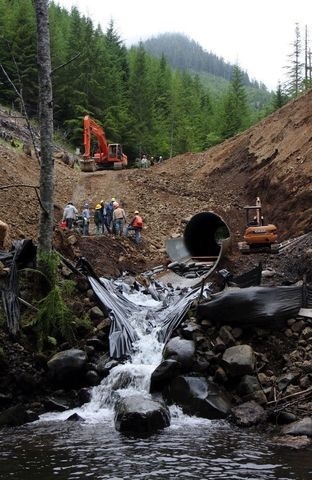 The majority of the real action at the moment involves removing culverts and decommissioning roads on Forest Service lands. I wrote a story about some of these projects for the Kitsap Sun last August. As an aside, I’m not sure I like the term “decommissioning” when it comes to roads, but I may be stuck with it. The project is usually more than “abandoning” a road, but less than “removal.” Anybody got a better term for it? 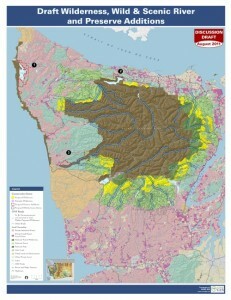 The economics of Olympic National Forest has been turned upside down. The forest was once the wood basket of the Northwest, generating enough money from the sale of massive fir and cedar trees to build roads, trails and campgrounds — and more roads. The forest generated enough money to support a large staff of foresters and forest rangers and have money left over to support other forests. Over the years, experts have come to realize that natural systems were often ignored in the effort to get the wood out. And this isn’t just the view of tree-huggers and spotted-owl lovers. Farmers and residents in the Skokomish River Valley have paid the price of too much logging and road-building in the upper watershed. Shellfish-growers and others who depend on natural resources have suffered, along with fish and wildlife best suited to old-growth conditions. And so the economics has turned. Now, much of the logging involves commercially thinning second-growth forests to restore old-growth conditions at a faster pace. Under new stewardship programs, the money can be used to decommission roads that are still sending massive amounts of soil and gravel downstream into the Skokomish River and other waterways. Congress is now putting money back into the forest for ecosystem recovery rather than taking money out. There is a lot more to this story than I was able to tell in today’s Kitsap Sun. It’s a story I’ll be telling for a long time to come.